Fungus is a spore-producing organism and just like a bacteria, PYRO-ENERGEN can do nothing for it. There are drugs and chemicals that are widely available today for treating fungal infections including "fungicides" and "nyzoral". Most respond well to medication, although treatment may take several weeks. Do they work for you? Even if they do, it may require a long-term therapy to see its effectiveness. You cannot find doctors and scientists who know the mystery of fungus. It just is the same as virus and other diseases of unknown cause. The easiest way to kill fungus on the surface of skin tissue is by applying heat on the infected area. 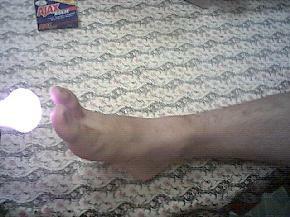 Prepare an incandescent light bulb 40–60 watts as you can see in the two photos below. 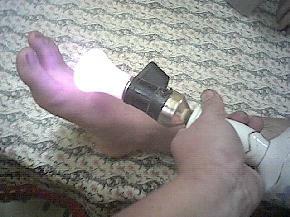 Place the bulb as close as possible to the affected area of your skin surface. Keep the light there until you cannot endure the heat, and then move it away. Again, apply it the same way until you cannot endure the heat, and then move it away. Repeat the same procedure for about 15 minutes on one foot. Do this 3–4 times a day. By doing this simple method, almost all kinds of fungus problems will disappear in just three days. Don't you know that this is the cheapest and sure way? Yes, it is true that ultraviolet ray and infrared ray works in eradicating fungus in a laboratory but they do not work for your body.